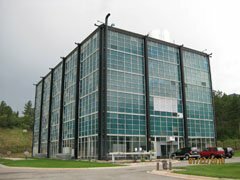 Schendt Engineering Corp. was the prime design consultant for this project. The plant has one 50MMBtuH generator (G-1) and three 100MMBtuH generators (G-2, 3, & 4). The plant HTHW distribution system is a primary/secondary pumping system. The primary focus of the project included replacement of the burners on the HTHW generators No. 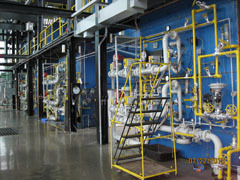 3 & 4, and replacement of the combustion controls and burner management systems throughout the plant. The project also included replacement of the forced draft combustion air fans on generators No. 3 & 4, installation of a flue gas economizer on generator No. 1, re-piping of the existing flue gas economizers on generators No. 3 & 4, replacement of the make-up water pumps, installation of a new seal flush cooling system for all of the HTHW pumps, replacement of the variable frequency drives for fans and pumps, and converting the plant steam cushion expansion tank to a nitrogen cushion. Generator G-3 & G-4 were each designed with two new burners fired as a single burner. 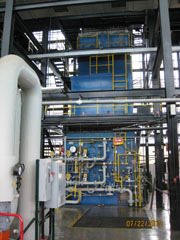 The combustion control system is a fully metered cross linked fuel-air control system utilizing Siemens 353 controllers. The burner management system is an Allen Bradley Compact Logix PLC based system. The burner management and combustion control system was setup with a touch screen Human Machine Interface (HMI) at each generator to provide ease of use and operator instructions. These systems were integrated to a front end OPC server via modbus communications portocal. The control room was equipped with three HMI workstations with 24″ graphics screens and three (3) 46″ wall mounted graphics screens for continuous system monitoring. The new and existing flue gas economizers were set up in what we refer to as a sidecar application on the HTHW return to the plant in order to circulate the coldest water possible to maximize their efficiency. The steam cushion expansion tank was re-piped and converted to a nitrogen cushion expansion tank to simplify the operation and allow the plant to operate at approximately 25°F lower temperature to provide additional energy savings. A new closed circuit fluid cooler was installed to provide cooling to the seal flush cooling system to conserve water and to provide cooling for the control room and network server/communications room. The existing variable frequency drives serving secondary HTHW pumps and forced draft fans were replaced with new VFD’s. New VFD’s were installed on the primary HTHW pumps to set generator HTHW flows versus using throttling valves to maximize pump electrical energy savings. The estimated cost of construction for this project is $6,000,000.